Succeeds in giving the general impression of a pivotal historical moment, and excels in crafting some of the most astonishing aerial-warfare sequences ever put on film. 132 min. United Artists Films. Directors: Guy Hamilton, David Bracknell. Cast: Laurence Olivier, Robert Shaw, Christopher Plummer, Susannah York, Ian McShane. Though it's commonly derided for its undernourished screenplay, Battle of Britain resembles its subjects in the British Royal Air Force: both get the job done with classic British "stick-to-it-ness." 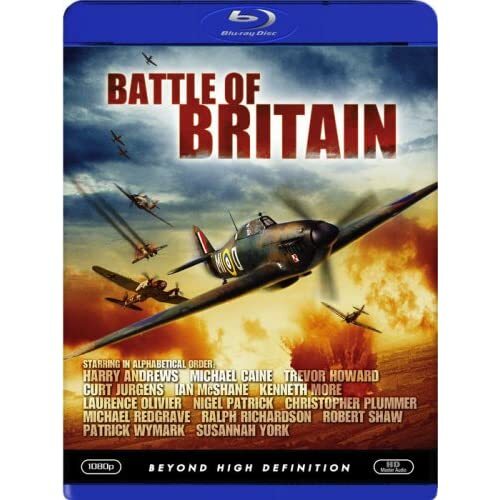 As brought to the screen by the crack team of director Guy Hamilton and producer Harry Saltzman (collectively responsible for many of the best Bond pictures), Battle of Britain succeeds in giving the general impression of a pivotal historical moment, and excels in crafting some of the most astonishing aerial-warfare sequences ever put on film. In terms of production design, costumes, and especially vehicles, Hamilton's film is handsomely mounted. An exhaustive search landed the production a fleet of aircraft that at its time ranked as the 11th largest air force in the world: 27 single-engine Spitfires and a healthy number of German Messerschmitts, Heinkels, and Stukas. This isn't your grandson's CGI action picture: in the hands of Hamilton and the great cinematographer Freddie Young (Lawrence of Arabia), the dogfights captured in camera feel exhilaratingly real. The too-red sixties blood and a couple of fake-looking flameouts are exceptions that prove the rule: for the most part, the combination of actual action (including cockpit P.O.V.s), models, and special effects creates a powerful cinematic illusion of "you are there" warfare. Adapted by James Kennaway and Wilfred Greatorex from Derek Dempster's novel The Narrow Margin, the film opens in 1940 France, with the German Blitzkrieg making mincemeat of the RAF. Sir Hugh Dowding (Laurence Oliver) sends a message to Winston Churchill: it's time to get real. Reorienting to a "Battle of Britain" is the only path of potential survival, and a narrow margin at that. "The essential arithmetic is that our young men will have to shoot down their young men at a rate of four to one if we're to keep pace at all," he writes. Dowding serves as a dour point of reference throughout the film, lest anyone grow too encouraged by small victories. Most of the film is spent in the company of the young flyers who necessarily make the most of their limited flight hours as they're repeatedly, and often without warning, thrust into combat with German pilots. Hamilton's film leans toward documentary, so we don't learn much of anything about these young men except for what's conveyed on their faces. Battle of Britain's narrative collage is dramatically inert, but by checking in with the politics and strategies of both sides, gives appropriate context to the dogfights that enliven the story. On the German side, we hear from Baron von Richter (Curt Jurgens), Field Marshal Albert Kesselring (Peter Hager), Reichsmarschall Hermann Goering (Hein Riess), and even, unnecessarily, Hitler (Rolf Stiefel), seen giving one of his fiery propaganda speeches at a rally. The British-side drama stays mainly on the plains of the RAF airfields, except for one concession to the potential female audience: the thinly sketched romantic travails of Squadron Leader Colin Harvey (Christopher Plummer) and his wife, Section Officer Maggie Harvey (Susannah York). They face two major challenges in their relationship, one hastily resolving the other as the couple suddenly exits the story, late in the picture. 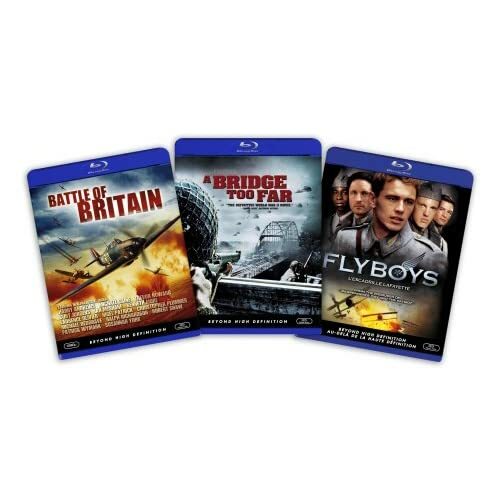 True to the style of many '60s and '70s war epics, Battle of Britain is an all-star affair, bringing together Harry Andrews, Michael Caine, Edward Fox, Trevor Howard, Ian McShane, Kenneth More, Michael Redgrave, Ralph Richardson, Robert Shaw, and oh so many more. It goes without saying that the film is a nirvana for WWII aviation enthusiasts, but anyone with a taste for historical war pictures with realistic combat depictions can appreciate this one of the "they don't make 'em like this anymore" variety. This Blu-Ray is a bona fide beaut, with a remarkably clean and detailed image and thundering DTS 5.1 Master Lossless Audio soundtrack. It's a testament to the technicians behind this disc that this nearly forty-year-old film has such a powerful impact in high-definition home video. MGM's previous DVD editions were bashed for changes made to the subtitled dialogue, music, title sequences, etc., but this Fox issue corrects those errata. Unfortunately, no bonus features have been ported over from the 2-disc DVD Collector's Edition, but by gum, I'll wager that fans of this film who are Blu-Ray-equipped won't regret making this upgrade in the film's content and presentation. All site content © 2000-2019 Peter Canavese. Page generated at 04/23/2019 01:37:15AM.